AMUSEMENT PARKS, RIMINI and the HINTERLAND. Rimini offers not only a beautiful beach and night-life, but also: culture and fun parks for all ages! AMUSEMENTS PARKS in Rimini, Riccione and surroundings, with pools and waterslides, roller coaster and many other games, shows and entertainment with different areas dedicated to different age groups! They are suitable for young people but also for families with kids. The ticket usually includes a free entry the following day. Here are the most popular, click on the banner and go directly to the site of the parks! For any information about how to reach them, just ask at the hotel reception, the public transport lines are inexpensive and they have frequent runs, also in the evening and at night. 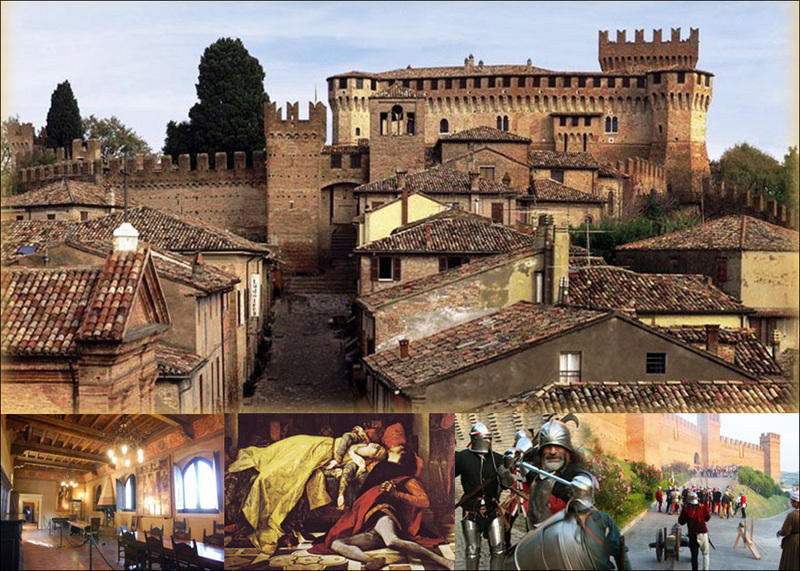 Rimini was dominated in the Middle Age by an important family of the Italian history: the Lordship of Malatesta, who left us the Rimini's Cathedral, the Sigismondo Castle, churches and artworks of great value. ARCH OF AUGUST (Arco d'Augusto): It was built in 27 A.C. in honor of Caesar Augustus. This is the oldest surviving Roman arches. On the building you can admire the deities of Jupiter, Neptune, Apollo and Minerva. TIBERIUS BRIDGE (Ponte di Tiberio): The impressive bridge was built over the river Marecchia, by a decree of Emperor Augustus and it was completed under the reign of Tiberius between 14 and 21 AD. It's five arches are entirely built with Istrian stone. It's foundations ensure the maximum stability. MALATESTIAN TEMPLE (Tempio Malatestiano - Duomo ): It is usually called Duomo, in fact it is the town's cathedral. The Malatestian Temple dates from the early 800 and it is the most important building of the Renaissance in Rimini, although it is incomplete at the top. In 1809 the temple was consecrated as a cathedral of the town and dedicated to St Columba. The PINE CONE FOUNTAIN (Fontana della Pigna ): It is located in the centre of the town, in the well known Piazza Cavour. The base of the fountain dates back to Roman times, while the upper part was built in 1543. Designs and reliefs from which it is adorned, come from a temple located in the Three Martyrs Square (Piazza Tre Martiri), now disappeared. The fountain constituted the only source of drinking water in the city until 1812, when it was built the aqueduct. The 4 HORSES FOUNTAIN (Fontana dei Quattro Cavalli ): The Fountain of the four horses was inaugurated on June 29, 1928. It survived the passage of the front in 1945, but the tub was demolished in September 1954 and his 4 horses were transported to the local office of the Fire Department. Only after nearly two decades of alternate hypothesis of "relocation", the tank was rebuilt and along with the horses, it was relocated to its original location in 1983. Wonderful green places where history, art and culture are blended in a charming and fascinating way. 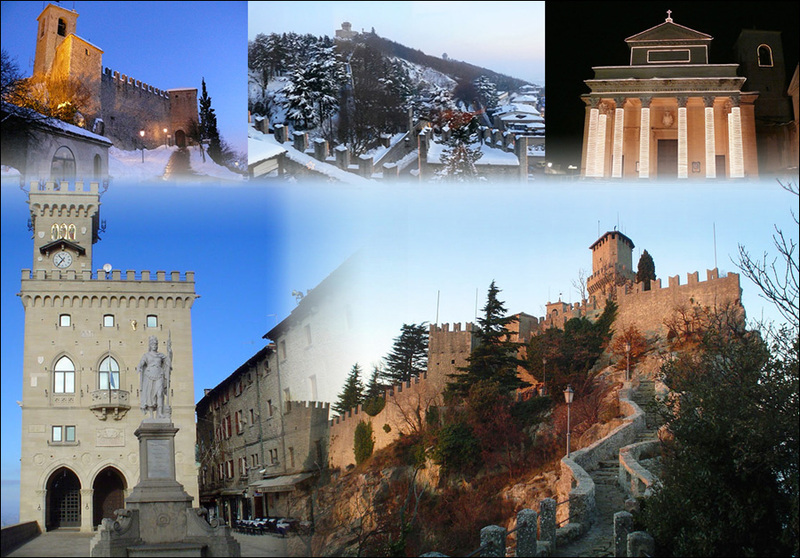 REPUBLIC of SAN MARINO: This small state is situated on Mount Titano and is also known by the nickname of "Ancient Land of Liberty." Remained unscathed through centuries of history and fights, it has preserved its autonomy. Its economy is mainly based on commerce and tourism. SAN LEO: It stands on a sharp rock and it is famous for its medieval fortress, that was precious during wars thanks to its impregnability. Then we recommend to visit the beautiful Basilica built in the seventh century and dedicated to St. Leo and set in lush and unspoiled nature. SANTARCANGELO: This small town, a magical and beautiful village should not be missed. In Santarcangelo you can visit a beautiful Romanesque church, a magnificent central square with fountain, the beautiful Malatesta Fortress, the Etruscan caves, the Ethnographic Museum of Customs and Traditions of Romagna. In its restaurants you can taste real traditional specialties of Romagna. VERUCCHIO: Verucchio is the home of Villanova culture. It is fascinating and suggestive with its walkways that lead to the upper part of town surrounded by ancient walls. MONTEGRIDOLFO: It is located on the border between Romagna and Marche and it is worth visiting for its old town that smells of tradition and magic. Montegridolfo dates from the XIII century. The "Castrum Gredulphus" dues its name to the Guelph Family of "Gridolfi" wich came from Rimini and who settled here during the period of contending with the adverse party of the Ghibellines. GEMMANO: Going from Gemmano towards the "Conca Valley" (Valle del Conca) you can reach Onferno (the ancient "Castrum Inferni" )where you can visit the suggestive carsic caves. You should not miss the "Natural Reserve" with its magnificent Botanical Gardens. GRADARA: This beautiful town stands on the border between Marche and Romagna, just 25 km away from Rimini. The largest and most impressive building is the wonderful castle built around the twelfth century by Rudolph De Grifo. Here in 1289 was consummated the tragedy of Paolo and Francesca, narrated in a famous canticle of Dante's Divine Comedy. The food products not to be missed are the delicious and renowned cheeses.